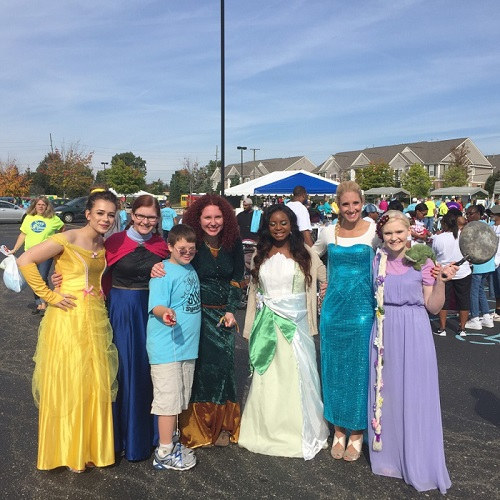 Each year, Families Exploring Down Syndrome (FEDS) selects a new theme for their annual Down syndrome fundraising walk. This year the theme is “Made in Michigan.” We sat down with co-chairs Donovan Meyers and Kadi Coe to talk more about the event and how they became involved with the organization. Kadi, Donovan, and the FEDS board are working hard to make sure this year will be the best walk yet! In addition to being at a new location, there will be activities for kids and adults of all ages. Participants can look forward to: a petting zoo (pony rides), bounce houses, cotton candy, popcorn, games, a Choo Choo Train, face painting, DJ, clowns, magicians, balloon animals and more! There will also be a food tent where people can get a meal. “The D.A.D.S. group is donating the food and they’ll be the ones cooking and serving meals to walk participants,” said Donovan. FEDS has a goal of raising $40,000 through the Thumbs Up for Down Syndrome: Made in Michigan Walk. The donations raised from the walk are vital to the programming opportunities FEDS offers families in the community throughout the year, including: the Parent to Parent program (new parents receive basket with materials and gifts), Summer Scholarships (every child that applies for a scholarship can use the money for therapy, swim lessons, etc. ), social gatherings (like the Christmas party, Summer Picnic, World Down Syndrome Day celebration, etc. ), and New Parent Brunches (parent’s w/ kids under three years meet with more seasoned parents). The walk also helps fund activities for older adults like: bocce ball, sporting events, dances and more. To show your support for FEDS and the Thumbs Up For Down Syndrome: Made in Michigan Walk, please visit their fundraising site at http://www.ds-stride.org/fedsmithumbsup. To learn more about FEDS, please visit http://www.familiesexploringdownsyndrome.org.